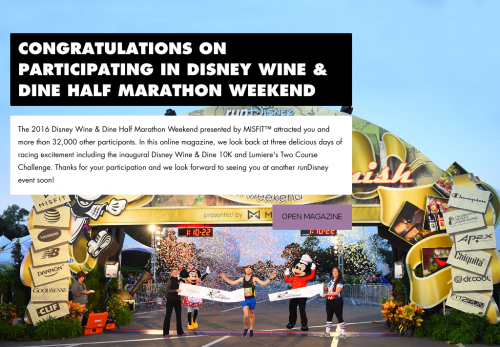 The 2016 Disney Wine & Dine Half Marathon Weekend presented by MISFIT™ attracted you and more than 32,000 other participants. In this online magazine, we look back at three delicious days of racing excitement including the inaugural Disney Wine & Dine 10K and Lumiere's Two Course Challenge. Thanks for your participation and we look forward to seeing you at another runDisney event soon!